The Jackie Cameron story is universally told, and now we have Travis Finch, whom Jackie praised in her final appearance here as the young man she insisted we take on at all costs, because she didn't want him cooking for anyone else! High praise from the high priestess. Hartford House is honoured to have been voted a Fine Dining Platinum Restaurant by American Express positioning it amongst South Africa's best restaurants for the10th consecutive year. Twelve years ago a petite blonde waif wafted into the Hartford kitchen. A demure little thing with cherry lips and an endearing smile, her icy blue eyes betrayed a steely determination. Head Chef Richard Carstens (later to become South Africa's Chef Of The Year during his tenure at our new venture, Lynton Hall,) was about to depart for the opening of that South Coast hostelry, and Jackie Cameron had been recruited to step into his foreboding shoes. Around the same time, our parent business, Summerhill Stud was developing the momentum that would take it to nine consecutive national Racehorse Breeders' titles, the culmination of some twenty-five years in business, so nobody knows better than us what it takes to climb Everest. While a location 12 kilometres outside the dustiest little dorp in the Midlands of KwaZulu-Natal, may be the ideal spot for a thoroughbred farm, it's not the place you'd ordinarily choose to make a name for yourself in the culinary trade. After all, it's a long way off the beaten track, and a heck of a long way from the tourist trap which is Cape Town and its environs. Somebody recently told us there were more than 65,000 eateries in South Africa, and that puts making the nation's top ten restaurants bang into perspective. The thing is though, to build a reputation, you need something of a passing trade, and not too many "foodies" in those days made the pilgrimage up the Hlatikulu road. Earlier this year, the Hartford restaurant received the ultimate international accolade, when the senior food critic at The Wall Street Journal counted it in the top three country restaurants on the planet, and we wondered whether it could get any better than that. After all, competition for a place in Eat Out's Top Ten is more intense than it ever was these days, and South Africa's top restaurateurs now rank with the very best in the world; in any event, how do you separate number one from number twenty? Truth is, the judges do, just as they do with their Michelin gradings in Europe, and quite marvellously, last evening they counted little old Hartford in the top five in South Africa. Given its size, its geographical disadvantages and the fact that we're not on "Main Street" when it comes to aspirant young chefs wanting to work where the lights are brightest, this is a remarkable tribute to Jackie Cameron's god-given gifts, a dedication uncommon in the world anywhere, and a team of people that've travelled every extra mile she's taken them. There've been times when their hearts were making appointments their bodies were not designed to keep, particularly remembering that when this little venture started out seventeen years ago, there was no-one in this district with a hospitality skill to speak of. That's the exciting thing, because we still have many miles to travel, and there's still plenty of room to make it even better. Spare a thought for my wife, Cheryl, for a moment. She was the eldest of seven in a big Catholic family: she left school before it was over, to lessen the burden on a prolific father, with nothing but her natural talents, as yet undiscovered by the larger world, to recommend her. Hartford House was Cheryl's idea, and I have to confess that I and our financial people did everything we could to dissuade her from embarking on this venture, from spreadsheets showing the business would be bankrupt in six months, to reminding her that hospitality is the toughest business in the world (after racehorses!). That she and this little team in the heart of Zululand have arrived where they have this day, is a sign; if ever it was needed, that nothing is impossible: miracles just take a little longer. Besides, it's a sign that all is well in this beloved country of ours, and this is the way to make it work. From one champion team to another, well done! "African cuisine is colourful, diverse and cultured, and is a largely unexplored aspect of the continent that offers a refreshing alternative to game drives and extreme adventures." The recently launched Africa.com Restaurant Guide offers restaurants gradings in three tiers. 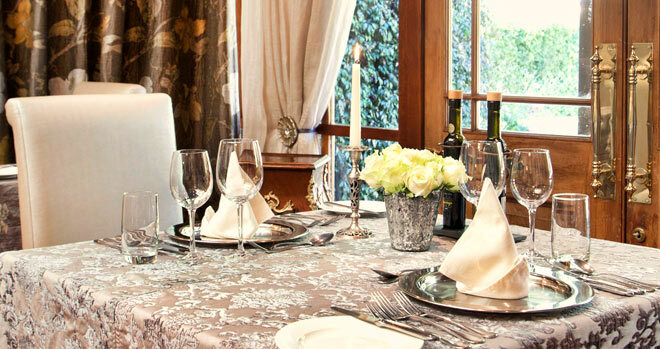 The platinum establishments are the crème de la crème­, those that offer an exceptional dining experience. They are followed by the gold tier, which offers culinary excellence, and the bronze tier which offer solid choices for casual dining. Restaurants are rated according to their service, quality of the food, wine list, general ambience and value for money. Four restaurants; two from Gauteng and two from KwaZulu-Natal, were singled out for platinum status at the launch. There are also four in the Western Cape which have yet to be announced. The restaurants are Five Hundred at the Saxon and DW Eleven-13, both in Johannesburg, and Ile Maurice and the restaurant at Hartford House, both in KwaZulu-Natal. "We know we made the right choices," says Benny Masekwameng, a member of the Africa.com culinary council and a Masterchef South Africa judge. "We need to let people know what we can do. There's a lot that's said about our country in terms of other attractions, and now our industry has the chance to reach a wider audience around the world." Masekwameng says the country has top-notch culinary talent, but that talent needs a platform such as Masterchef and now, the Africa.com restaurant guide. 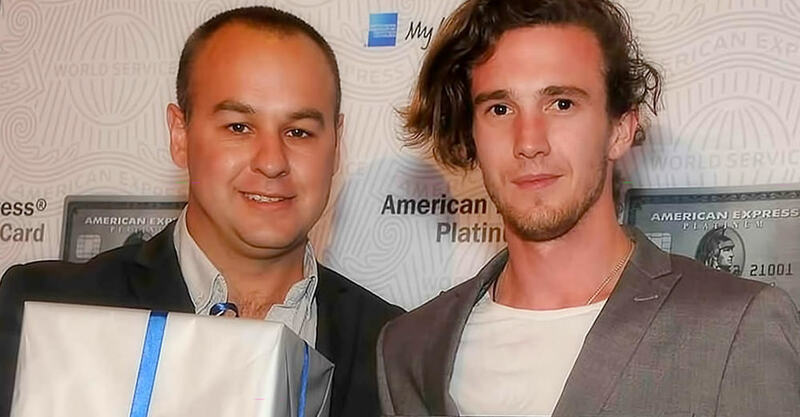 All the qualifying restaurants were announced at the launch, and those achieving platinum also received a plaque which they can display with pride. "Africa.com is the definitive address for information on the continent," says the culinary council's third member Richard Harden, who publishes a highly regarded guide to restaurants in the UK, "and we expect the restaurant guide will become the obvious choice for diners in Africa." "What better way for a restaurant to get expert advice on what people want?" says Masekwameng. "From the top traveller with money to spend to average tourists, the list caters for everyone. But you need to make sure that your establishment delivers - it's all about consistency and keeping the reputation you've built." Hartford House is honoured to have received the 2012 RASA Rosetta Award of Service Excellence. 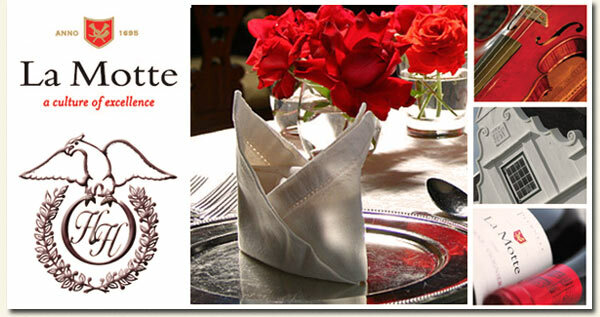 The RASA (Restaurant Association of South Africa) Rosetta Award is an award given to restaurants and individuals that strive for Service Excellence in the restaurant industry. It is recognition of the highest honours for service excellence and overall contribution to the upliftment of the restaurant industry in South Africa. When we last checked the stats, there were more than 70,000 restaurants or eateries in South Africa. That was six years ago, and there are probably many more today, which makes the food business just about the most populous sector in the economy. If you look at the biggest contributors to the Gross Domestic Product, there are not that many mines, it's doubtful there are that many banks, it's unlikely there are more farmers, there certainly aren't that many car hire companies, and there are many more restaurants than there are hotels. That means the food game is as competitive, if not more so, than any other sector of the economy, though the title of "best restaurant" is always going to be a subjective issue. Yet there are a few names and places that pop up consistently year after year, and when they do so in a number of competitions adjudicated upon by different judges, then you know that the acclaim is pretty much universal. The point of all this is that last night in Cape Town, Hartford House once again made the nation's "Top Ten" at the Eat Out awards, the only restaurant in KZN to do so, and the only one to have made the finals in each of the past six years. Head Chef Jackie Cameron turned 30 on Saturday, which means that besides being voted South Africa's best restaurant in the Visa/House & Leisure awards in both 2010 and 2011, and Eat Out's most popular restaurant in the latter year, as a personal milestone, Jackie's been occupying the place of a finalist since she was 24, which in itself was a record. She'll be the first to admit though, that these accolades come courtesy of a team effort, and she'll point immediately to her long-serving (and long- suffering!) assistant Elaine Boshoff, to a great back-up team in the kitchen, to a marvellously hospitable crew in the front of the house, and to an ambiance and atmosphere that belongs only to an historic property like Hartford and its award-winning gardens. We do need to acknowledge though, that our location puts Hartford at something of a disadvantage. We're ten kilometres outside a dusty little dorp in the KZN Midlands, at the forgotten end of what the civilizations to the North of us have often referred to as the darkest continent. We do not see anything like the traffic that traverses the winelands and the environs of Table Mountain, nor for that matter, the populations of the greater Johannesburg, Pretoria or Durban areas, which makes this award all the more commendable. That there are just two restaurants outside of the Western Cape in the "Top Ten", illustrates just how deep the culinary waters are in that part of the world, and equally, how good you have to be to be counted in their illustrious company. In all of this, we need to pay our respects to those who've guided our team over the years in arriving at this day. Fundis like Victor Strugo, Anne Stevens, Eat Out's Abigail Donnelly, Derek Taylor, Anna Trapido, Paula Mackenzie and the late Lannice Snyman, among critics of the printed media, Justin Bonello of BBC Food's "Cooked In Africa", Masterchef's Pete Goffe-Wood and members of organisations such as Chaine des Rotisseurs have all been inspirations, and let's not forget the encouragement and the acclaim of our guests. 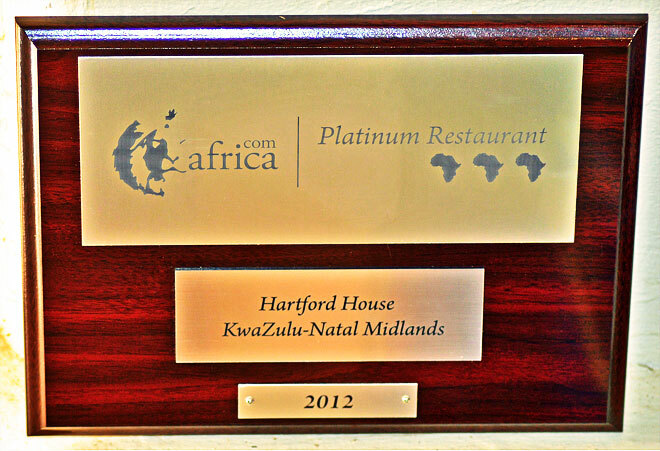 Customers are the lifeblood of our business, and their appreciation of the Hartford food experience has not only nurtured the creative spirit in our kitchen, but it's reminded the team that sets the tables and carries the plates that in Africa, by contrast with many other places in the world, it remains an honour to serve. "It has been a dazzling year of fun dining," said Eat Out editor and judge, Abigail Donnelly. "I have seen local chefs prepare astonishing, world-class food, and the top restaurants in South Africa have shown tremendous talent, continuing to push the boundaries in terms of creativity, confidence and full-on flavour." International judge Bruce Palling was similarly impressed by the standard of cuisine on offer in this country. The UK-based food columnist, who writes for the Wall Street Journal Europe and is on the judging panel of the World's 50 Best Restaurants, praised the range and dedication of South Africa's leading chefs. "Some of the chefs would rank in my personal top twenty anywhere in the world." There are just a handful of hospitality establishments in the land that can celebrate a Diners Club Diamond Class wine list, and Hartford House is among them. Yet Hartford is unique, inasmuch as it is among a select few countrywide to have enjoyed the highest recognition of its wine selection by Diners Club in their annual awards for 10 consecutive years, and coming as it does hard on the heels of the announcement that Hartford's restaurant has once again made the nation's top twenty, this "Diamond" is especially welcome. The recipients of the 2013 American Express Fine Dining Awards were announced recently and we're proud at Hartford House to have been awarded the Platinum accolade; counting Hartford among the nation's most prestigious fine dining establishments. This is the 15th year in which the Awards have been held and sitting on the judging panel were renowned food critic Victor Strugo, food writer Anna Trapido and Cape Town-based 'foodie' Tamsin Snyman, assisted by a team of anonymous and experienced assessors. Congratulations to Head Chef Jackie Cameron, GM Vanessa Coetzee and the entire Hartford Team. The nation's top twenty restaurants were named by Eat Out magazine last evening. The list recognises the best restaurants in the land, and is one of the gourmet world's most prized accolades. The Hartford restaurant is included for the 6th consecutive year in what is billed the "Oscars" of the South African food industry, and it's a wonderful tribute not only to Jackie Cameron, Elaine Boshoff and their team in the kitchen, but to the whole show. Eat Out recognises a restaurant not only for its food, but for its service, its ambiance, and the broader experience, and it's a matter of some pride that we remain the only KZN-based restaurant in the list in 2012, and of course, to have made the finals in each of the last six consecutive years. When fortune smiles on you, you'd better remember just how illusive these things are. The six consecutive National Breeders' Titles that've befallen Summerhill in recent years, have been matched almost blow-for-blow by the "little sister" Hartford House, and it's much acclaimed restaurant. Most followers of these columns are already aware that Hartford once again made the Country's Top Ten Restaurants at the Eat Out Gala Function in Cape Town last weekend, the only recipient in KwaZulu Natal. And that this followed hard on the heels of it's second year-in-row billing as House and Leisure / Visa's Best Restaurant in South Africa in October. But there was more to come; in a brand new initiative this year, Eat Out launched a parallel competition on the web to find South Africa's most popular restaurant, sponsored by the makers of La Motte wines, spectacular gems of Franschoek. By a margin of more than double of it's nearest pursuer, Hartford House was polled the "Top Dog", the best sign if ever it was needed, of the loyalty of its customers and that it is, without any doubt, the "People's Choice". Spare a thought though for where we are. Surely the remotest of all the leading 20 restaurants in the nation, and in a province, assuming the critics got this right, not entirely celebrated for it's culinary hot spots, on a little old Zulu farm 10km outside of the dustiest dorp in the KZN Midlands. Goes to show, when the show's good, anything is possible. We look forward to that case of La Motte. If you voted for us, come and enjoy it with us!